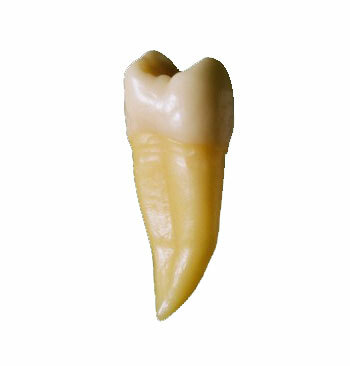 This web site includes two practice modules for deciduous and permanent teeth identification. A relatively easy module, for beginners, in which each tooth is placed at the right orientation (mandibular or maxillary) and an occlusal drawing of the teeth arches (according to Kraus and Jordan) is available; and a more difficult module, for advanced students, in which all the teeth are placed at the same orientation and the occlusal drawing is missing. To submit your answer simply check the appropriate radio button and click on the check answer button to see if you answered correctly. If you need help identifying the tooth, click on the Give me a hint button. An occlusal snapshot of the tooth will appear. Clicking on the "Additional hint" button will identify the cusps or the orientation of the tooth (which will make the identification even easier). And finally, clicking on the The answer is... button will reveal the correct answer. Click on Next to go to the next question. You can stop the quiz at any time to return to the same screen later. Simply remember the page number of the last question you answered and directly go there from the Index page.